The daffodil: an early flower and symbol of hope; a nice way to end the month of March and start the month of April. Greetings! I would like to share with you an announcement about my latest art show. 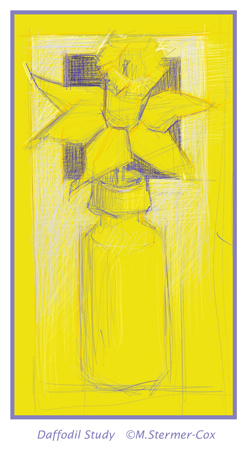 Plus, I have a couple of daffodil drawings to show you. You see, I thought they would be a nice way to close out the month of March and greet the month of April. 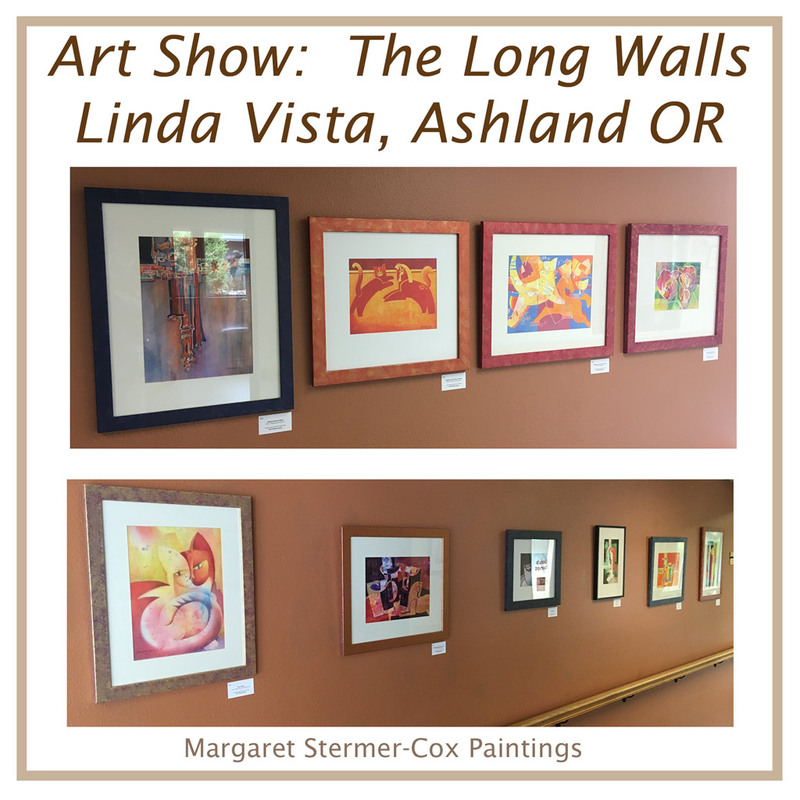 New Show: Linda Vista (Ashland OR). 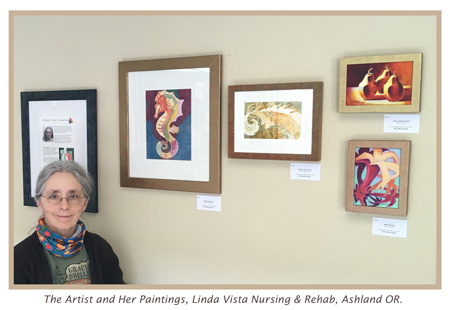 First up, I am pleased to announce that I have 18 paintings now hanging at Linda Vista Nursing and Rehabilitation Center in Ashland, OR. 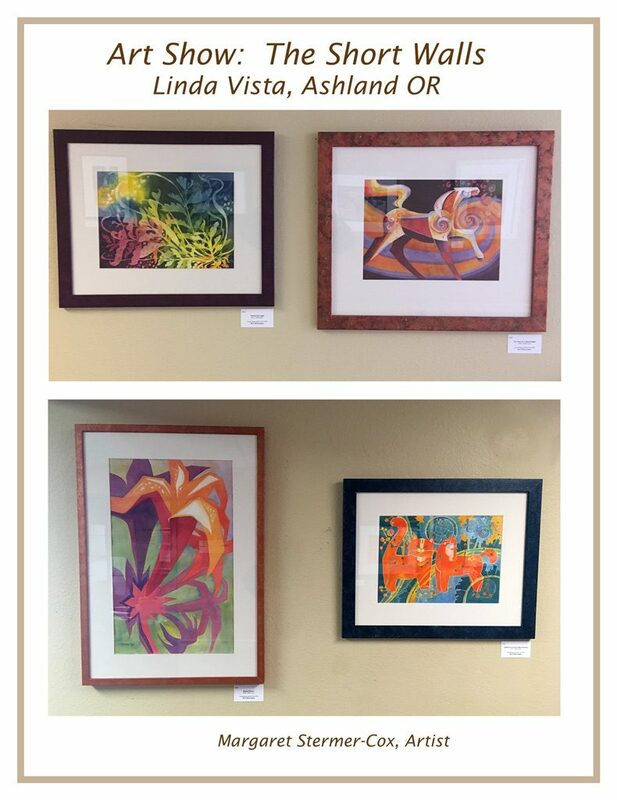 The wonderful people at Linda Vista will show my work through the month of June. 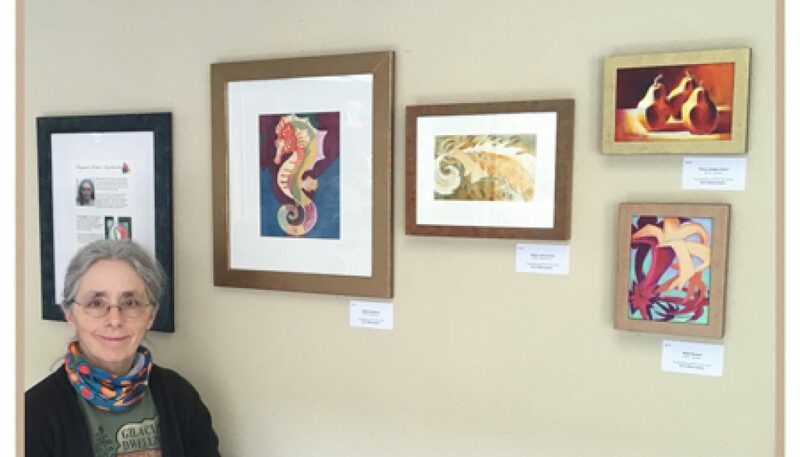 Displayed in the nursing facility’s lobby hallway, you may view the paintings during normal business visiting hours. Linda Vista’s address is 135 Maple St., Ashland OR. Some of you may recall, I displayed my artwork here before in late 2015 to early 2016. I would like to acknowledge that this is an Art2Business show. Let me elaborate. Art2Business acts somewhat like an agent or go-between. They facilitate the meeting of artists, art and venues. In other words, Linda Vista has an arrangement with Art2Business. And they selected me, as one of the Art2Business artists, to show in their venue for approximately three months! So, thank you Art2Business and Linda Vista! I thought I’d share my artist statement with you. First, though, it might be helpful to know that I curated my paintings to ensure a bright and cheerful collection. In other words, I wanted to create a joyful display to greet patients, family members, visitors and staff. I like to paint the joy of life and do so by including people, cats, ponies and coffee cups. Drawn from imagination, these are the characters through which I like to show the wonderful, humorous side of life. Naturally, bright colors and fun shapes help support the message of joy. To begin with, the daffodils are in bloom these days in our Rogue Valley of Southern Oregon. They have been blooming for a couple of weeks. And, coincidentally, I have a few in my garden. Such festive bright flowers in early spring. So, naturally, I thought I’d draw and paint them while they are still in bloom. To my surprise, they are challenging to draw from life. Their are a couple of issues, you see. For one thing, there is the perspective of the corona or cup. 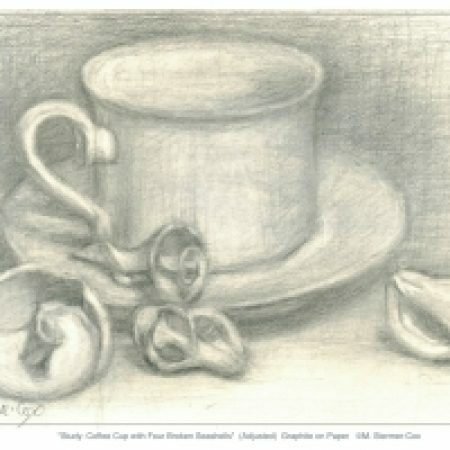 I chose to draw the flower with the cup in a nearly frontal position. Its like looking down at a tube head on. Take the point of view and add on the fact that the flower is yellow and, then, you have an interesting challenge. To explain, what color are the shadows of yellow flowers? As I look at the flower, the colors look greenish or gray. Hmmm, my mind does not want to paint a yellow flower greenish gray. I will have to persuade it, that is my mind, to do so. Also, parts of the yellow tend toward orange, and others, again, toward green. In any case, its sometimes amazing to note that a seemingly simple subject like a daffodil has its challenges! I did draw a different point of view on my iPadPro using the app Procreate. 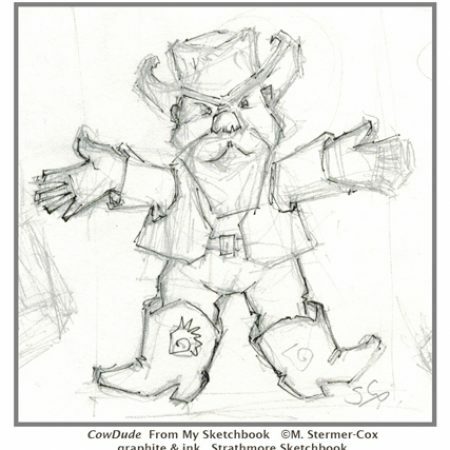 Sometimes when I’m drawing or painting a subject, I like to look up symbology, history and other small cultural “gee whiz” type facts. For example, daffodils are a national flower for Wales. The symbology and meaning of daffodils is complicated. 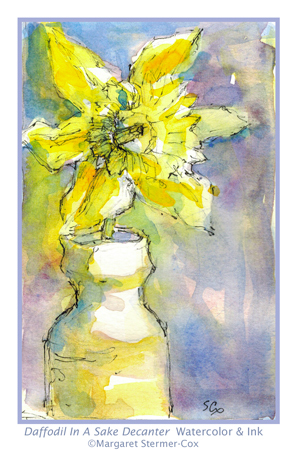 For example, one daffodil, like in my artworks, implies misfortune; OOPS! I ought to add more! Because, you see, multiple daffodils mean joy and happiness! I guess one daffodil just looks lonely. And, as you might gather, meaning and symbology varies with country, culture and history. If you are intrigued by such floral messages, you might want to check The Daffodil Society of Great Britain. Their blog has an interesting article about the language of flowers and the daffodil in particular. So, with that, I leave you with two drawings of a single daffodil. I hope that since there are two drawings then that counts as multiple daffodil. Its about being joyful and happy!